Rochester continues to be victimized by job sprawl. The city continues to lose thousands of jobs to the suburbs. These jobs are migrating further and further away from the city. Census data shows the city lost about 30,000 jobs between 2002 and 2014. Meanwhile, about 21,000 jobs have migrated to outer-ring suburbs or outside of Monroe County. Our transit system will never have the resources to accommodate job sprawl. Only one-third of the region’s residents can get to a job by bus within 90 minutes. As a result, people are forced to drive alone to work. People without vehicles cannot access jobs. The median income for city residents who have jobs is $26,460. Owning a car costs about $8,558 a year. Putting jobs on transit lines saves residents money. There is less wear and tear on roads when vehicle miles traveled are reduced. Locating jobs near people cuts down on vehicle miles traveled and greenhouse gas emissions. By using infill lots for new construction, green space is preserved. 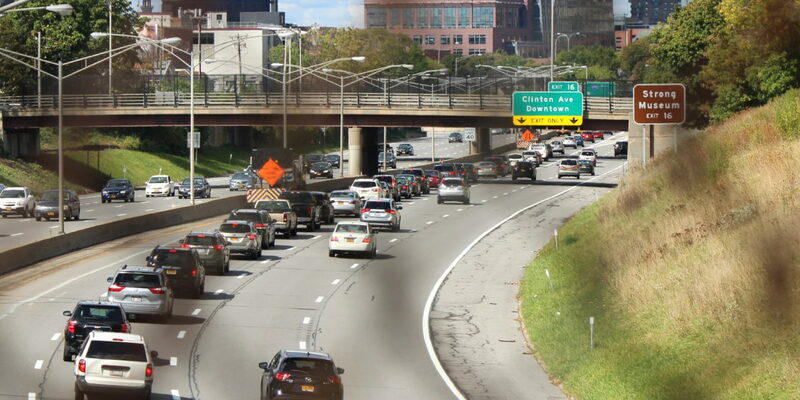 The city must push the Finger Lakes Economic Development Council, Empire State Development and Monroe County to enact policies that incentivize locating jobs in the city, and de-incentivize locating jobs in areas not accessible to transit. State and federal policies enabled the flight of residents and jobs from the city. For example, building highways and other infrastructure allowed people to abandon urban areas. Cities were hurt by not being able to expand their borders. They were left with a shrinking tax base and poorer residents. We can enact policies that reverse this harmful trend.